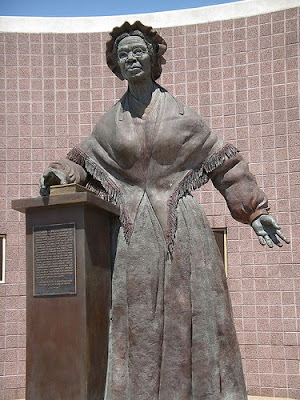 The woman who eventually became Sojourner Truth was born Isabella Baumfree. One of 13 children, she was born in 1797 on the Colonel Johannes Hardenbergh estate. 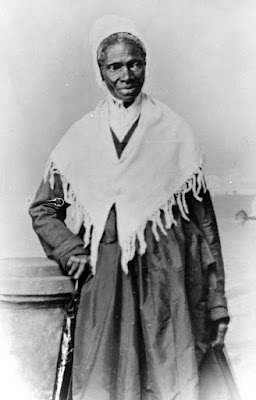 Her parents Elizabeth and James Baumfree were slaves on the estate in Swartekill which was a Dutch settlement in upstate New York. Isabella spoke only Dutch until she was sold from her family around the age of nine. She was sold along with a herd of sheep to John Neely for $100. Neely's family only spoke English and beat Isabella constantly for frequent miscommunication. It was during this time that she found refuge in religion and started to pray aloud when she was scared or hurt. Over the next few years she was sold a number of times and endured horrific treatment at the hands of her owners. 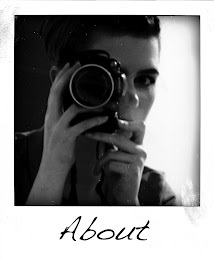 Circa 1815 she fell in love with a fellow slave named Robert. Robert's owner forbade the relationship. He did not want his slave having children with a slave he did not own as this would mean that he would not own the new 'property'. Robert visited Isabella but was followed by his owners who beat him savagely, bound him and dragged him away. She never saw him again. Isabella bore Robert a daughter whom she named Diana. In 1817 Isabella was forced by her owner to marry an older slave named Thomas. They had four children: Peter, James, Elizabeth, and Sophia. In 1799 the state of New York began to legislate the gradual abolition of slavery; which actualized on July 4th 1827. Isabella's owner at the time, Dumont, had promised her freedom before the state emancipation on the condition "she would do well and be faithful." She did so but he claimed a hand injury had made her less productive and used this as an excuse to renege on his promise of freedom. She was angry but continued to work until she had completed enough labour to quell her sense of obligation to him. She escaped with Sophia and later spoke of the incident "I did not run off, for I thought that wicked but I walked off, believing that to be all right." "Well, children, where there is so much racket there must be something out of kilter. I think that 'twixt the negroes of the South and the women at the North, all talking about rights, the white men will be in a fix pretty soon. But what's all this here talking about? Then they talk about this thing in the head; what's this they call it? [member of audience whispers, "intellect"] That's it, honey. What's that got to do with women's rights or Negroes rights? If my cup won't hold but a pint, and yours holds a quart, wouldn't you be mean not to let me have my little half measure full? Then that little man in black there, he says women can't have as much rights as men, 'cause Christ wasn't a woman! Where did your Christ come from? Where did your Christ come from? From God and a woman! Man had nothing to do with Him. If the first woman God ever made was strong enough to turn the world upside down all alone, these women together ought to be able to turn it back , and get it right side up again! And now they is asking to do it, the men better let them. Obliged to you for hearing me, and now old Sojourner ain't got nothing more to say. " 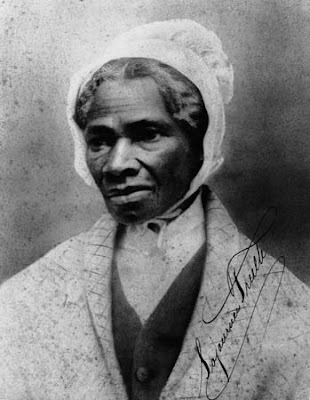 Truth met Harriet Beecher Stowe, who wrote about her for the Atlantic Monthly and wrote a new introduction to her autobiography 'The Narrative of Sojourner Truth'. 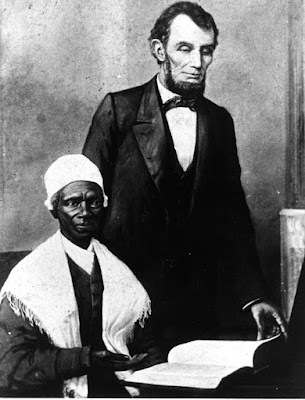 During the Civil War she raised food and clothing contributions for black regiments and met Abraham Lincoln at the White House in 1864. Whilst she was there, she tried to challenge the discrimination that segregated street cars by race. 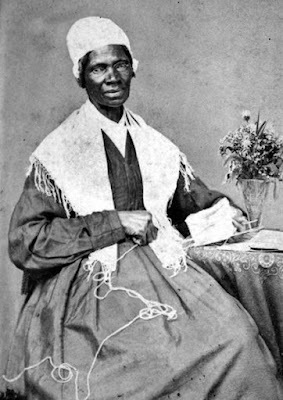 After the Civil War ended she again spoke widely-mainly to white audiences and mostly on the topics of religion, African American and women's rights. She remained active until 1875 when her health started to deteriorate. She died in a sanitorium in 1883 due to infected ulcers on her legs and was buried in Battle Creek, Michigan.